Tacos are a mainstay in our house. In fact, in my head Tuesday is “Taco Tuesday”. It’s one of the 3 meals a week I don’t really have to think about. Meal planning is hard for me for some reason, so I build in 3 meals every week that are the same. These are meals that go over well with the family and include ingredients that I almost always have on hand. This way when I’m making my shopping list for the week, I already know those ingredients go on the list and those days are planned. In the midst of my busy days, home schooling, keeping kids alive, and all the other things I do, it helps if I have to think less. I’ll just be honest. It also helps if I’ve got homemade spice mixes made up and ready to go. 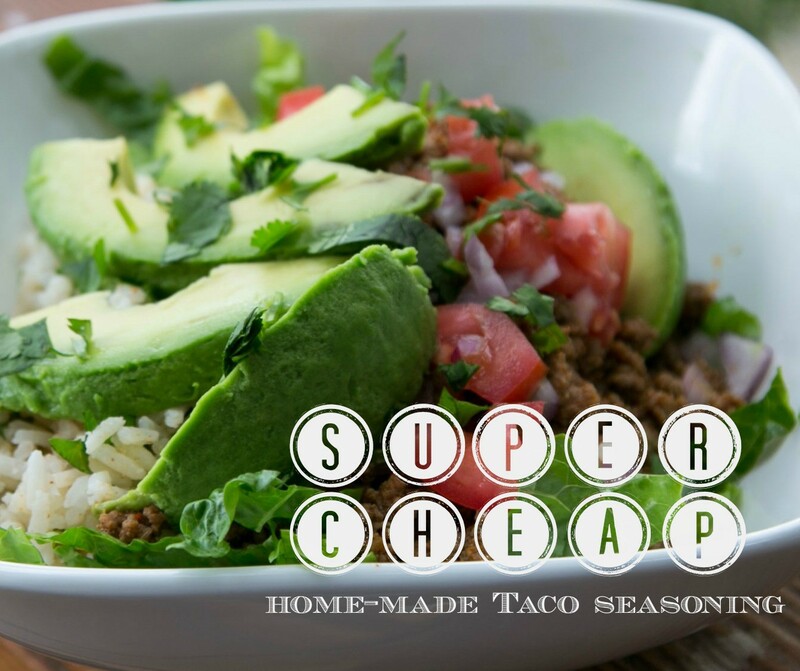 This super cheap and tasty home-made taco seasoning comes together so quick and you can scale it to make a bunch at once. You also avoid MSG and other additives that are in the packaged seasonings, and the unhealthy salt that they use. This is a fantastic mix, better than any package, and it will save you money to throw it together on your own. It’s all the little purchases that add up over time. Making room in your grocery budget for better food means doing a little work, but this is pretty painless. I use organic spices that I either get from my favorite online supplier or I order them in bulk from Frontier. 1 tsp (or more to taste) himalayan salt or celtic sea salt would work as well. 1-2 TBL organic tomato paste– this is in a glass jar, not a can. Additionally you could add red pepper, paprika or any other hotter spices that you enjoy. Most of my kids get scared of the word “spicy”, so this mix is approved by the whole family. Feel free to adjust to your own tastes. Mix all the dry ingredients together and put aside. You can keep this in an airtight container or use it right away. When you are ready to make tacos, brown and drain your meat. Add the seasoning, 1/3 cup of water, and the tomato paste and combine well. Let it simmer for a few minutes until it thickens. Adjust seasoning to your liking. Remember if you can’t get the flavors to pop, add salt by small increments until you get the flavor you are looking for. Taco bowls are so versatile, you can top them with whatever you like! We shred some lettuce, slice avocado and tomato, and top it all off with home-made salsa and fresh cilantro. Yum!